This year, there is a notable change affecting the metro line connecting the city with the venue. Since February this year, the new metro line L9 connects Barcelona Airport (BCN) with the city. One new station of L9, called “Fira” (do not confuse with the station “Europa Fira”) is located only a short walk from the VMworld venue entrance. Read more about this important change below. How do I get from the Airport (BCN) to the venue? And when I arrive outside the shuttle operating hours? The quickest and cheapest way from the Airport to the city is using the Aerobus. Aerobusses are operating between the city and Terminal 1 (5:00am to 00:30am) as well as Terminal 2 (05:30am to 00:30am). They offer a frequency of about every 10 minutes – so you will not have to wait very long. You can buy a one-way ticket for 5,90 Euro or 10,20 Euro for both ways (valid within 15 days). If you arrive in Terminal 1, you can find the Aerobusses 50 meters straight ahead the arrival area, downwards the stairs on the right side. Is there a shuttle service between the venue and the hotels? No, there is no shuttle service provided by VMworld between the venue and the hotels. But Barcelona has a very efficient metro network and most attendees are using it. In the last years, there were sponsored metro passes available at the Info Counter or at the Lower Lobby. 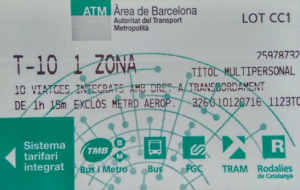 So I can only recommend you to register and get your badge immediately after arrival in Barcelona and pick up your metro tickets. If no metro passes are available this year, take a look at the T-10 metro pass. This travel card is valid for 10 intermodal journeys – for most of you “1 zone” should be sufficient. Check the TMB website for further information. After the venue, a lot of parties and events are taking place (find the list of parties, events and gatherings during VMworld 2016 here). Take care in advance about shuttle services or use the metro to get there by your own. And if all else fails do not hesitate to take a taxi. They are not exorbitantly expensive and will get you quickly and safely to your destination. For those arriving at Terminal 2 the metro station is outside the building next to the train station.